I posted a BYGL Alert on Beech Blight Aphids (Grylloprociphilus imbricator) late last month (see Return Engagement of Boogie-Woogie Aphids, July 20, 2017) and described their peculiar behavior that earns them the alternate common name of the "boogie-woogie aphid." When disturbed, colonies of these aphids will shake their white woolly derrieres in unison as a synchronous samba. It is speculated this mass-wiggling distracts potential enemies from focusing their attention on single individuals like the movements of herds of larger herbivores can confuse meat-eaters. According to the research, all nymphal instars will bite predators, but the 4th instar nymphs (last nymph stage) are particularly aggressive. Indeed, I didn't realize just how aggressive until I experienced first-hand the bites of these unusual aphids while photographing a colony this past Friday. I could not help crushing some unfortunates as I held a cut sample to snap some of the shots included in this Alert. It has long been documented that various aphids will produce an "alarm pheromone" when threatened that causes nearby aphids to flee. Indeed, I was concerned that my aphid-destruction would cause the colony to move away from my camera lens. However, instead of fleeing, the beech blight aphids around my grasping-crushing fingers began to crawl onto my fingertips. Almost immediately, I began feeling something like a cross between a burning and stinging sensation. Looking closely at the aphids, it certainly appeared they were jabbing my fingers. Indeed, their aggressive attack caused me to christen them with some new common names! My observation was not scientific; however, there is no doubt that these aphids don't behave like "miniature wildebeests." I frequently use this analogy to describe the shared position on the food chain for many herbivores; everything eats wildebeests and everything eats aphids! Perhaps notoriously bad-tempered water buffaloes are a better model for beech blight aphids. The aggressive nature of beech blight aphids on American beech may explain something that I've observed over the years. I commonly find various predators (e.g. lions) such as lady beetles, lacewing larvae, and Syrphid fly (= hover fly) larvae culling aphid colonies. However, I've never found these meat-eaters slashing through beech blight aphids. Of course, something certainly eats this native aphid; their populations tend to rise and fall from year-to-year. I just haven't observed them yet and I'd be interested to know how they avoid the aphid's jabbing mouthparts. I must end with a few important notes about beech blight aphids. First, they are only found on American beech (Fagus grandifolia); they are not found on European beech (Fagus sylvatica). The woolly aphid found on European beech is the Woolly Beech (Leaf) Aphid (Phyllaphis fagi) which does not occur on American beech. Unfortunately, you will sometimes find misidentifications and miss-use of the common names on the Web. Second, despite their sinister sounding common name and penchant for appearing in large white masses, beech blight aphids cause little to no harm. It has been reported that their sap-sucking feeding behavior may cause localized stunting or even dieback of affected twigs or branches. However, the colonies do not spread through the canopies of their American beech host to cause harm to the overall health of affected trees. Management is not required. 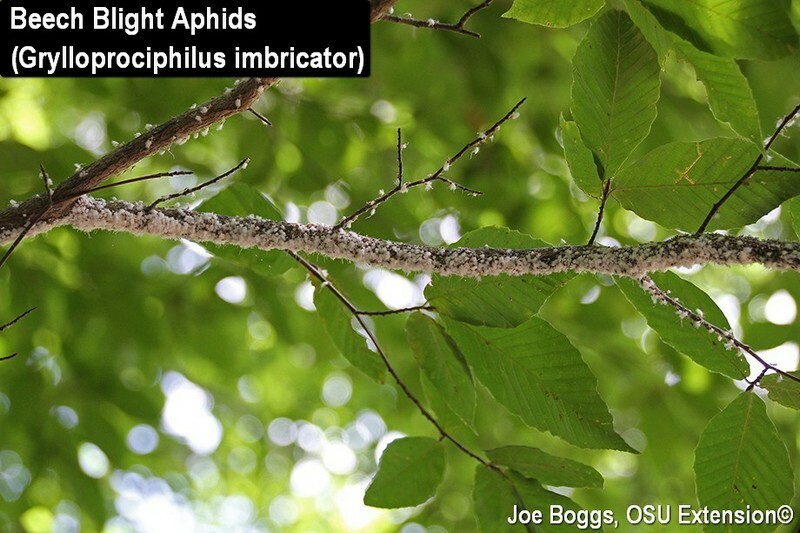 Finally, beech blight aphids are prolific producers of honeydew. The sooty mold fungus, Scorias spongiosa (Ascomycete), has an obligate relationship with beech blight aphid honeydew; it does not make a living on anything else. In fact, the fungus is so specific to the aphid it is sometimes called "beech blight sooty mold." Fungal growth begins like most sooty mold fungi; it grows as a dense, black, "fuzzy" mat on top of the honeydew. However, over time, the mat thickens into a brownish, furry mass. Then the fungus progresses into a growth phase that is unlike most sooty molds; it produces a spongy, golden-yellow heap that may rise 1 - 2" or more above the leaf or twig surface. The odd looking fungal growths look like nothing else that would commonly be associated with aphids or honeydew.